In today’s Outside the Box my good friend Charles Gave shares an instructive “Tale of Two Countries.” Since 1981 in the UK and France, structural growth rates have diverged: The rate has fallen by two-thirds in France, while in the UK it has risen. Why? Well, to begin with, in the UK Margaret Thatcher was elected prime minister in 1979 and almost at once reduced the role of the bureaucracy in managing economic activity and dialed back government spending as a percentage of GDP. Meanwhile, in France, François Mitterrand was elected president in 1981 on a platform that expressly aimed to expand the scope of government. The effects on growth were predictable, says Charles, having been explained by Joseph Schumpeter in his 1942 book Capitalism, Socialism and Democracy. He challenges readers to cite one case in the post-1971 fiat-money era when a big increase in government spending did not lead to a structural slowdown. Very interesting reading and certainly an Outside the Box viewpoint. GoGo Online tells me I’m over Cleveland, flying by my friends there at 34,000 feet on my way to Boston for a few brief meetings before I fly right back tomorrow morning. But my team tells me the meetings are important enough to get me on a plane to be in Boston for less than 20 hours. Plus hassling with airports. You have to trust the team! I have been using the past few weeks to try to catch up on my reading and email, but I think it was Solomon who first said that of the writing of books there is no end. And that’s when they did it on papyrus scrolls. But with the internet? With millions of writers? Solomon had it easy! Of course, he had 500 concubines (or something like that – I forget), so he had other distractions as well. I am struck by the amount of serious academic research coming out on how deep our partisan divide is in the US and much of the rest of the Western world. We truly have lost the shared values, that “we’re all in this together” attitude that I seem to remember from my youth. We simply don’t trust the “other team” and in general don’t associate with them. Of course, you and I are the exception. And thus when we read about the divide, we wonder what world the authors are describing. Certainly not ours! But… it’s a very clear trend and it’s disturbing me. I worry about how we’ll handle the Great Reset when it hits. Crises are not particularly good times for deeply nonpartisan solutions to come into being. But for now it’s summer, and Saturday we leave for the Virgin Islands to get married and have a week-long break together, so I think I’ll shelve my mood breaker for a few weeks. And you have a great week, too! …really? I would advise readers to consider the chart below. On first blush, its lower pane supports the stagnationist camp. After all, both the US and France have seen a slump in their “structural” GDP growth rate, as shown by the seven year moving average. Since 1977 this measure has fallen by a third in the US, and by two thirds in France. Yet, look at the chart’s top pane and it is clear that this growth slump has hardly been generalized. Since the late 1970s, Sweden, the UK and Switzerland have seen their growth rates rise structurally, and the same pattern can be found with Canada, Germany and Australia. So why have certain economies tumbled into relative decline, while others have not? A useful approach may be to compare France and the UK, which are similar in size, population and demographic profile. Both countries are European Union members with big banking sectors that in recent decades have had to manage profound de-industrialization. Consider the chart below which shows a ratio of real GDP in France and the UK. No adjustment is made for currency movements as this will introduce unnecessary noise into the analysis. 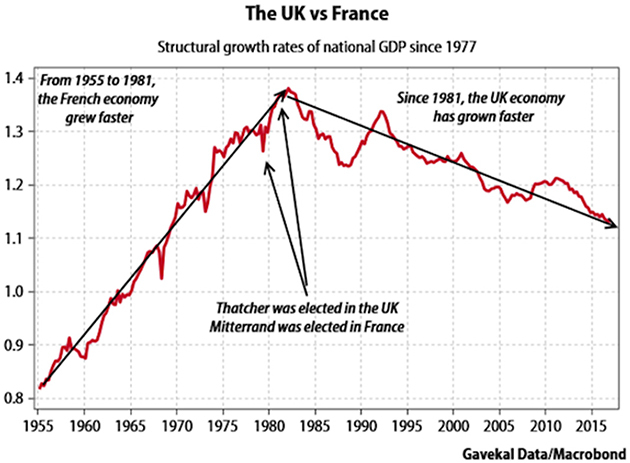 The obvious point is that between 1955 and 1981, France’s economy massively outperformed the UK’s. Since 1981, the reverse has been true. The trend change corresponded to a political shift in both countries as to the proper role of the state. Under Margaret Thatcher, the UK forged a new path by lessening the role of civil servants in managing economic activity. In France, François Mitterrand expressly aimed to expand the scope of government. To be sure, the UK Labour Party got back into power in the late 1990s and spent the next decade running socialist policies that caused government spending as a share of output to rocket higher. Fortunately, sanity was restored after 2010 when a Conservative-led government dialed back UK public spending. In France, the picture is different as there have not been politically-inspired changes in the trend of government spending—the ratio has simply ground higher, irrespective of who was in power. 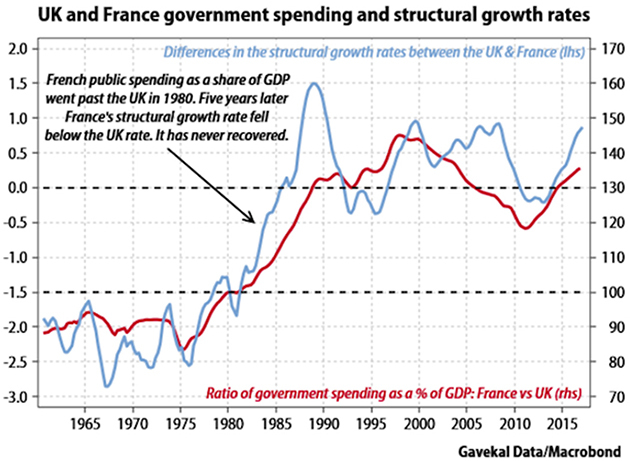 The next task is to explore potential cause-and-effect linkages between public spending and the divergence in the structural growth rates of France and the UK. As such, consider the chart below which reconciles growth and government spending in the two economies. 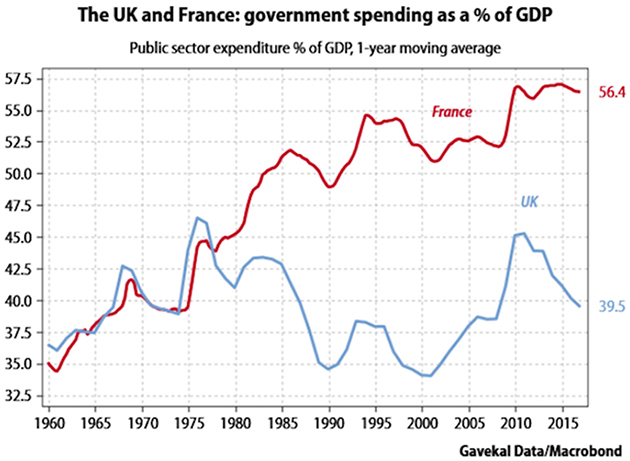 The chart above shows that in 1980 France started to spend more on government than the UK. 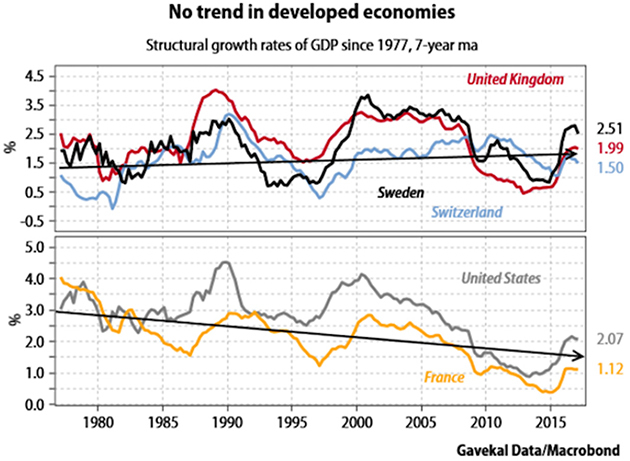 By 1985, France’s structural growth rate slid below the UK rate and has not recovered. The logic behind this chart has been borne out in many economies: beyond a certain threshold (that varies by country) more state spending causes the structural growth rate to fall. This relationship follows, as in a government-dominated economy “destruction” of inefficient activity is all but impossible, which in turn limits the scope for fresh “creation”. This insight was explained by Joseph Schumpeter in his 1942 book Capitalism, Socialism and Democracy. In the US, a similarly straight forward picture emerges, with the big increase in government spending that took place after 2009 being the main cause of the subsequent decline in the US’s structural growth rate. 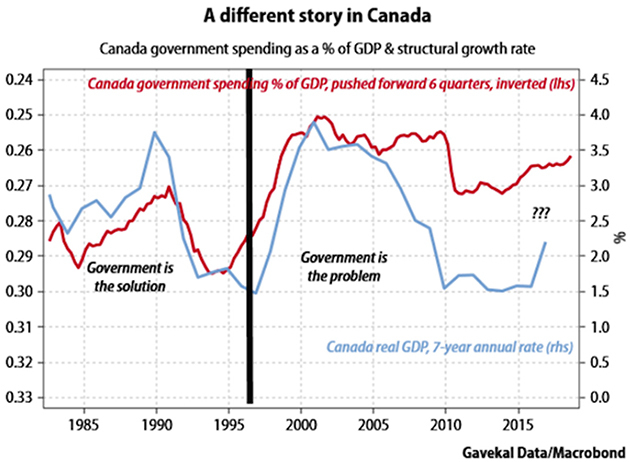 By way of contrast, consider the reverse case of Canada, which in the mid-1990s slashed government spending to good effect. In two years Canadian government spending was cut from 31% of GDP to about 25%. The ensuing 18 months saw predictable howls of protest from economists that a depression must follow. In fact, not only was a recession avoided but Canada’s structural growth rate quickly picked up and in the next two decades a record uninterrupted economic expansion was achieved. 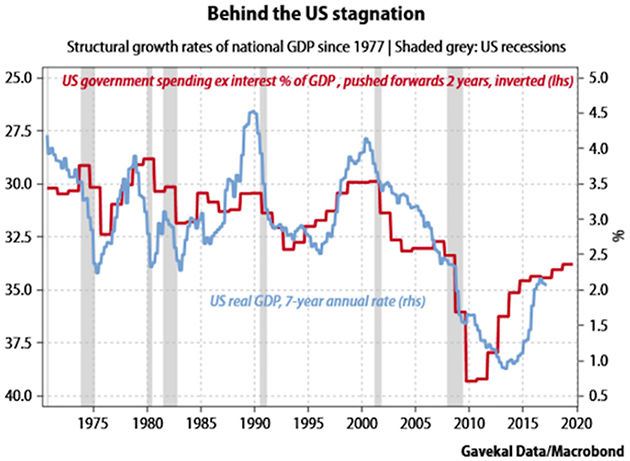 As an aside, I would ask readers to cite one case in the post-1971 fiat money era when a big rise in government spending did not lead to a structural slowdown. Alternatively, if they could cite an episode when cuts to public spending resulted in the growth rate falling. I am always willing to learn and change my mind! To conclude, “secular stagnation” is an idea of ivory towered economists. Schumpeter showed how bloated government and unnecessary regulation crimps activity. The perhaps unfashionable answer remains to privatize state enterprises, deregulate markets and break up too-big-too-fail banks. In simple terms, some government is good; too much government is bad. June 25, 2017, 6:34 p.m. I am not sure I see the conclusion drawn about Canada. “In fact, not only was a recession avoided but Canada’s structural growth rate quickly picked up and in the next two decades a record uninterrupted economic expansion was achieved.” What expansion? The chart above shows GDP contracting NOT expanding and the present time. My conclusion is that even with less government spending our economy is still moribund. We are still “hewers of wood and drawers of water”. And with an increasing debt load per capita, Canada is going to have a tough time getting out of this economic slump. June 23, 2017, 10:16 a.m. The Canada and US examples are unconvincing. Correlation? Yes. Causation? Not apparent. Neither the dot-com boom of the late 90’s (which influenced Canada heavily) nor the subprime crisis in 2008 (which influenced the US numbers) were shown in the article to be the result of government spending decisions of the time. June 23, 2017, 8:51 a.m. In a more serious vein than my previous comment…... The demands of the people for more and more services and welfare are, too all intents and purposes, infinite. The means to supply those wants are finite. These days, in a democratic society, voters will elect those who make the biggest and most expensive promises - when was the last time a government was elected on an austerity programme or a promise of increasing taxes? On being elected, governments have to make some effort to fulfil their election promises, in the face of the unavailability of the wherewithal to do so. This had led to the ever growing debt burden on countries in the Western world. Charles Gave attributes the relative lack of GDP growth per capita to the percentage of government spending - it is equally valid to trace it to the rise in Government debt as a percentage of GDP - after all, they are two aspects of the same phenomenon. The failure to meet the infinite demands of the voting population, coupled with the prevalent belief that the State should be responsible for meeting those impossible demands, has generated the widespread lack of faith in Government and the divisive nature of the political split in country after country, leading many to the conclusion that democracy is no longer a medium term strategic option for a stable Western society. A catastrophic event akin to the GFC or the dot.com crisis of the early 2000’s may well have political consequences of massive disruption and a rejection of the current paradigm, even as the economic situation implodes. We have never experienced a world wide debt situation more out of control and it is impossible to predict how that will react with such a crisis. The virtually world wide rise in the percentage of the Government’s share of the national economy has medium term implications far more serious than a mere relative slowing down in any given nation’s growth. June 23, 2017, 8:22 a.m.
John, have a wonderful honeymoon. I know the state of the world and the economy is intensely worrying, but it will all survive the next couple of weeks. June 22, 2017, 3:45 p.m. The comparison of the UK and France is persuasive, although Mr. Gave pays lip service to the issue of regulation and has data only on spending. The assertions regarding the effect of the increased U.S spending in 2009 are less persuasive, because they make the fallacious assumption that because two things happened at the same time, one caused the other. In this case, a third thing, the Great Recession, likely caused both. So, while spending certainly increased, about half of that was in automatic entitlement spending, not a decision to increase. In addition, since it was borrowed, not collected in taxes, it’s hard to see what private spending it displaced. Further, the ensuing anemic growth rate probably did result from the stimulus spending, because that spending prevented a more severe drop in GDP. In other words, if the Fed had allowed a 10-15% drop in GDP, subsequent growth rates would have been higher. We would not necessarily be better off now, and GDP would not necessarily be higher than it is. June 22, 2017, 12:56 p.m. Reminds me of affirmative action government quotas on sports teams. Fans support affirmative action quotas for education and government but reject quotas in sports. Why? It “would hurt performance”. Government quotas, government interference, hurt performance. We are in an Ayn Rand, Atlas Shrugged moment. Fifty million productive hard working, mostly white baby boomers are going to retire, replaced by quota kids, government dependents, who are snowflakes. I hope the down turn hardens the snow flakes but I think they will just melt. The left is melting now, when times are good. Wait until subsidies dry up and it’s work for $10 an hour or starve to death. Government support for mothers has wiped out the family since 1966. Black mothers have 72% of their children born “out of wedlock” up from 25% in 1966. Whites are 29% single mothers, up from 5% in 1966. Why work when a baby gets a $30,000 a year in benefits? Quotas and government meddling in births and immigration have ruined America. Why did Paul Ehrlich tell us all to stop having babies in 1968 because the world will end and now we are importing low education, low status, low skill, low motivation, low achieving, foreign families who have 60% of their families on welfare of some type to prop up our lack of having more babies? Ehrlich was tragically wrong and should do jail time. Who let the 9/11/01 terrorists into America? THE GOVERNMENT not me. Trump wants to limit terrorism. I hope Trump can dial back the government and drain the swamp. Too many government employees on grotesque obscene secret pensions and benefits not factored in to their salary. I will be saddened by the pain of the next reset, as we have had in 1977, 1987, 1997, 2007, what’s next? 2017, obviously. It’s been manufactured, expect it, in September, or October. Be prepared. It will be fast, hard, and very ugly, possibly even socially destabilizing. June 22, 2017, 9:35 a.m.
Real GDP grows from either population growth or productivity growth. I did not see any comparison or adjustment for differences in the population growth, if any, between France and the UK. The claim that high government spending as a % of GDP slowed growth implies that all the slowdown in growth is caused by lower productivity growth caused by high government spending. The Sweden and Switzerland grafts show high government spending with growth in GDP, how does this fit in with your theory? June 21, 2017, 4:49 p.m. This data is in agreement with what the other Austrian economists—Mises, Hayek, Kirzner, etc.—would have expected.